On November 7, 2017, Health Canada implemented changes regarding the prescribing and dispensing of mifegymiso. Updates included indicating that, once prescribed, Mifegymiso® can be dispensed directly to patients by a pharmacist or a prescribing health professional, and allowing the drug to be prescribed up to nine weeks (63 days) into a pregnancy, rather than the previous limit of seven weeks (49 days). Directions for use remain the same. Patients should take the medication as directed by their health professional, either at a health facility or at home. 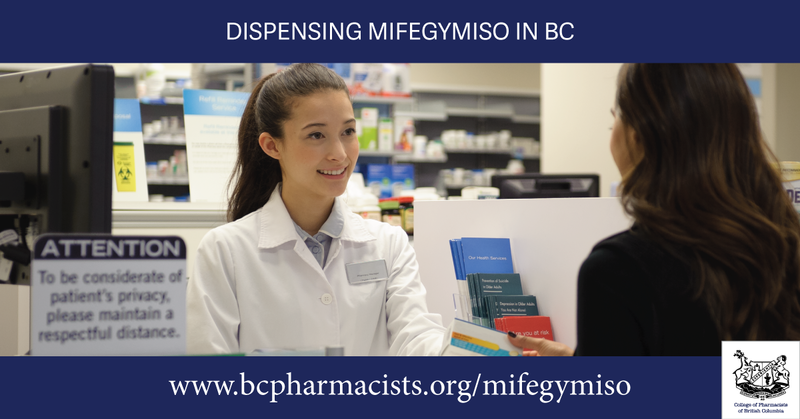 Previously the product monograph referenced the patient receiving the medication directly from their physician, although pharmacists in BC were able to dispense Mifegymiso® directly to the patient (pursuant to a prescription), which aligns with provincial legislation, and the College of Physicians and Surgeons professional standard, Sale and Dispensing of Drugs by Registrants. The Mifegymiso® package contains two boxes: one box contains 1 tablet of mifepristone 200mg, which when taken initially, blocks progesterone production in the uterus. This is followed one to two days later by the contents of the second box: 4 tablets of 200 mcg misoprostol taken buccally, which will induce contractions and cause a miscarriage. The College’s Code of Ethics requires all pharmacy professionals to practice only within the scope of their education, training and competence. Pharmacists and Pharmacy Technicians need to be aware of the limitations of their knowledge and expertise and refer as necessary and appropriate. The College does not require pharmacy professionals to undertake additional training for the dispensing of Mifegymiso®. The College of Family Physicians of Canada, Canadian Pharmacists Association, and Society of Obstetricians and Gynaecologists of Canada collaborated on developing a Medical Abortion Training Program. The program is designed for both physicians and pharmacists and consists of six online modules that review scientific evidence on medical abortion. It is intended to train health-care professionals on the safe use of Mifegymiso®. How does conscientious objection work in pharmacy practice? Will all pharmacies dispense Mifegymiso?